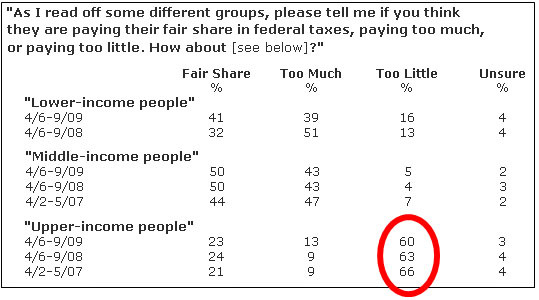 The answer is that Americans are sympathetic to higher taxes on the rich, as has been demonstrated by every poll on the question in the past two decades….Kevin Drum and Felix Salmon ignore not only massive evidence but also my many posts pointing to that massive evidence. My feelings are hurt. Not to boast, but just to boast, I have actually corresponded by e-mail with Drum and by some kind of instant messenger with Salmon.